The topic of sustainability raises endless questions – how ethical is it? Who is championing it? What does ‘sustainability’ *actually* mean? – but one of the most reoccurring is that of affordability. Is shopping sustainably reserved only for the wealthy? Up until recently the answer may well have been yes, with higher-end brands the only ones really experimenting with such fabrics. Now, with the polluting effect of the fast-fashion industry widely-known, the mainstream demand for solutions is paving the way for a vaster supply. 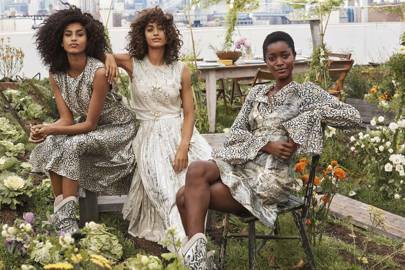 One of the first high street labels truly engaging in the supply of sustainable fabrics is H&M, who have just launched their ninth Conscious Exclusive collection. A substance made from citrus juice by-products, repurposing them to create silk-like cellulose fabric. A plant-based flexible foam using algae biomass from freshwater sources at high risk of algal bloom. A natural leather alternative made from cellulose fiber extracted from pineapple leaves. The even better news? Not only has H&M created an affordable line of groundbreaking pieces – some of the collection’s most popular blouses ring in at £17.99 while skirts and trousers range from , but it’s proving one of their chicest to date. With floaty, flattering silhouettes forming the collection’s backbone, there are whimsical, effervescent details wherever you look. Sparkling, recycled sequins catch the light while ruffles, uneven hems and cut-outs decorate the majority of pieces. We hope more high street brands follow suit and retailers introduce year-long collections just like this. Bravo, H&M.